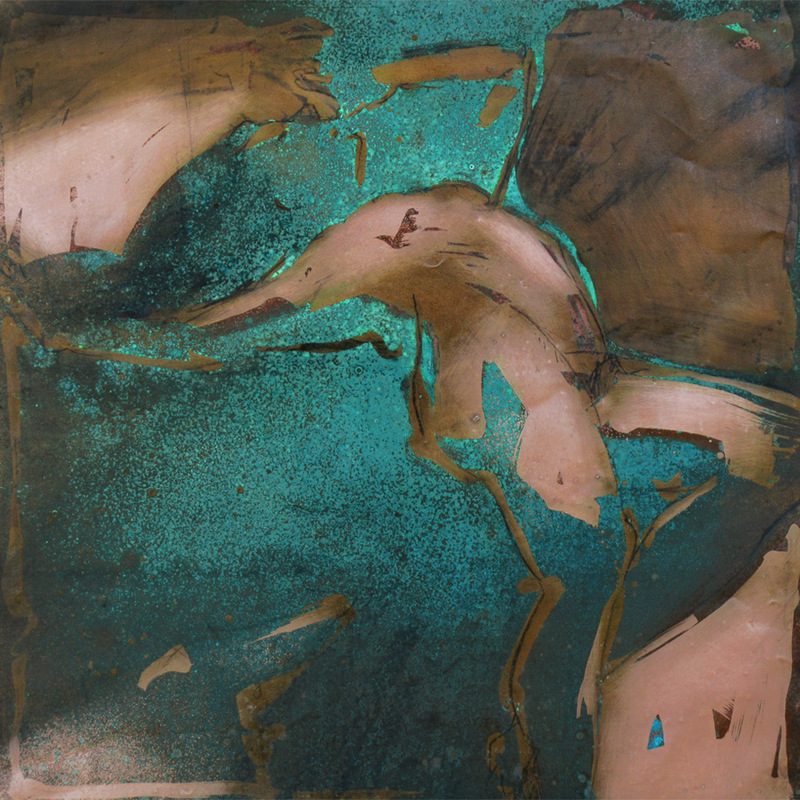 The medium of oil painting on oxidized copper is my unique adventure, a merging of traditional figurative painting on canvas and my explorative work in patinization of copper. The marriage of these two extremely different practices is a fascinating and wonderful exercise that has its own built in contrasts. The areas of pure copper have a glowing beauty. The primordial textures due to oxidation of the metal and the bravura brushwork have a brawn all their own. All together, these things provide tension and balance. And so the characteristics of the materials lend themselves to the subjects, and vice versa, in these paintings on copper. The paintings on copper you see here explore the use of copper sheeting as substrate. Viewers often describe a visceral response to this work, possibly because copper is an integral part of the human body. As one of the most basic building blocks of our universe, it is listed as Element 29 on the Periodic Chart. The Flemish masters painted on copper, but that was something different. They prized it for it’s extraordinary smoothness of surface — after being rubbed with pumice to a very fine finish and coated with lead white ground. In this way they eliminated the surface irregularity imposed by even the most tightly woven linen. The use of copper you see here has nothing to do with that at all (notwithstanding great respect for the Masters, of course). The way I am using this unique ‘copper as canvas’ provides some challenges and opportunities. A variety of acidic solutions have been used to create accelerated oxidation of the copper. The controlled oxidation creates darkening of the copper surface as well as blue, green and warm-colored areas. 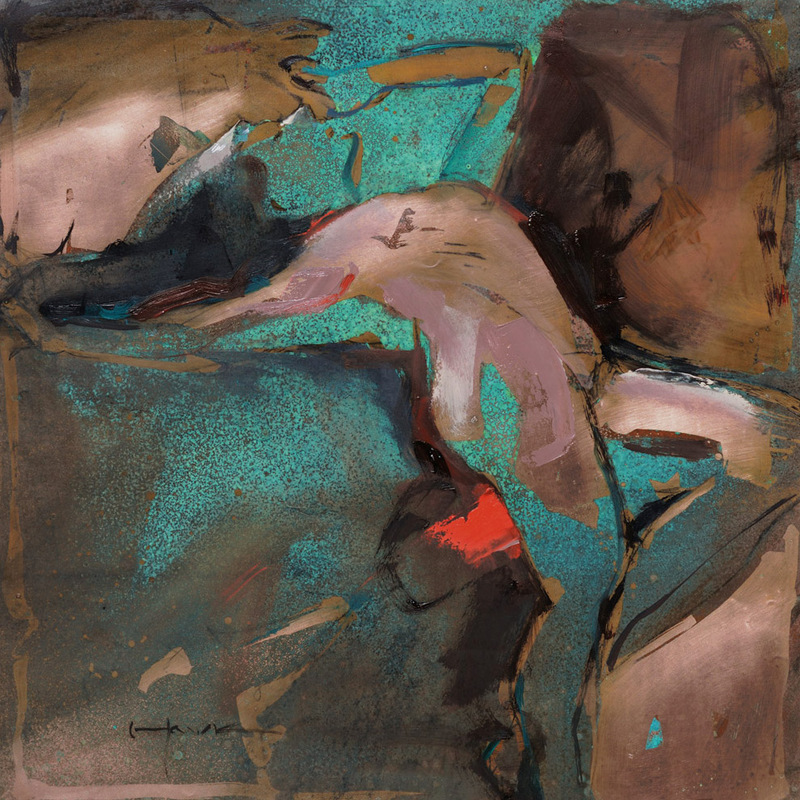 Varnishes were used as isolation layers. In this way, much of the image — carefully designed beforehand, in most cases — is created in the patination of the metal. Artists’ oil paints have been employed in the traditional way to bring the images to life. The copper sheets are mounted on sturdy backings to preserve and protect them. Works have been created in this way twelve years ago and more, and look today as the day they received their final lacquer. The oxidation is arrested and the image is frozen in time.